It's inevitable that roller shades and spring-roller blinds will loosen up the longer you have them. You may notice that your blinds can't retract, they're hanging loosely or you can't pull the rest of the blinds up. If this is happening, that means the spring on the interior roller is loosening. This occurs due to prolonged use or if the roller is out of place. People love tension shades because of the window treatments. They're super crisp looking, and they provide a lot of privacy and light control. Another benefit is that they're inexpensive and pretty easy to install. The shades have a coiled spring, which is controlled by something called a ratchet mechanism. The ratchet mechanism is at the end of one side of the shades. This spring mechanism is what causes tension on the shades. Over time, this tension can either become too tight or too loose. The spring can also completely uncoil. It's easy to adjust the shade so you don't have to replace the whole thing. All you have to do is pull your blinds down halfway and take the roller blinds off of the brackets. Once you roll the blinds back, wrap them evenly around the tube. Then, reinsert the blinds into brackets. It's essential that you test the blinds. If you don't check them, and the spring roll isn't tight, that means the spring is stuck. If the spring is stuck, all you have to do is unroll the blinds and remove them from the brackets. You're going to need to grip the pin on the spring end with pliers and turn the pin clockwise. Turn the pin clockwise until it tightens. After, slowly turn the pin counterclockwise until the interior of the roller blind catches. This will hold the blind in place. From here, you'll be able to roll the blinds back up and wind the blinds around the blinds' tube. You'll be able to reinstall the blinds again onto the brackets. 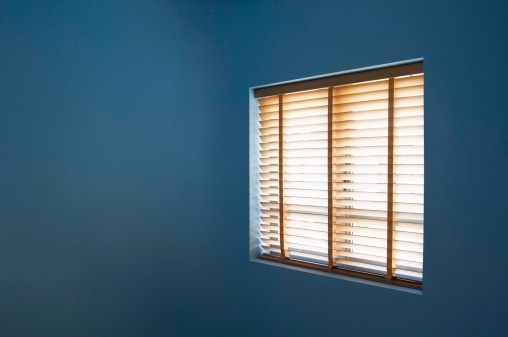 To make sure the blinds are correctly tightened, pull down the shade and tug the blinds. If they retract, that means they're properly tightened. All you have to do is stand on a stepladder, grasp the top of the shade and remove the brackets. Afterward unroll the shade halfway and grab the end of the shade to find the flat pin. Once you grasp the pin, grab your pliers and turn the pin clockwise. When you feel the tension, stop turning and allow the latch to hook back into the ratchet mechanism. Once you do this, set the shade back into the brackets. Make sure you pull the shade down, so you can check the tension.